I cook greens at least twice a week. Earlier it was only spinach and methi. Only recently I started using beet greens, swiss chard, turnip greens etc. Even though methi is bitter we all like it in our family. Our favorites are the methi theplas, sambar in the beet greens sambar method and another dry curry using channa daal and methi leaves. 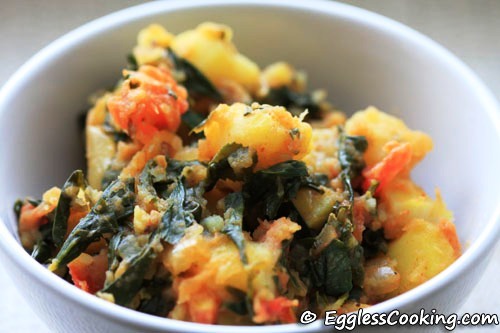 Recently I saw a recipe for aloo methi subzi in Sailu’s blog. That day I was going to cook methi anyway, so I decided to try Sailu’s recipe itself. It was very simple to make and tasted awesome too. Very different from the methi recipes I make. I pretty much followed her recipe but for some minor changes. tender, it will not be cooked properly if added in the end. The methi masala tasted very good with chapathis. This serves 2 adults. The very same day I also saw another recipe for a methi chole in her blog. I bookmarked it immediately and tried it last week. 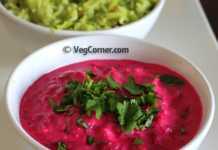 This is yet another easy to prepare side dish for bhaturas and rotis. Another speciality of this dish is, it does not use onions or garlic, and yet it tastes great. If you use canned chick peas like me, this dish can be prepared in no time. In this recipe also I used more methi than specified (3 to 4 cups loosely packed). I used one 15.5oz can chick peas, which is approximately 1 and 1/2 cups of cooked beans. I also used oil instead of ghee for frying the spices. This measurement serves 2 adults. Next RecipeCare For Some Homemade Strawberry Milk? I liked the idea of methi chole very much. Nice way to add nutrition to traditional recipes. 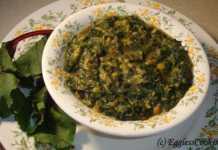 Thank you for the link and I’ll be looking for the methi leaves at a couple of local Indian grocery stores. looks yummy n mouthwatering yaar.. This dish look so gorgeous! I love methi too. u r right about the stiff methi u get here. once I had sprinkled methi seeds in a pot, and they grew like weeds near a window. they were so nice & fresh. superb and spicy side dish madhu. good company of roties even goes with rice i guess. looks perfect. 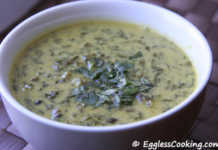 Such gorgeous methi recipes, Madhuram, and amazing pictures too. 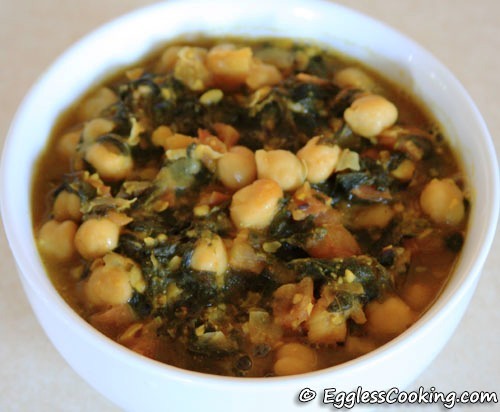 I love the idea of using chickpeas with methi which is quite possibly my favorite green. This looks delicious. I don’t know if I can get methi leaves here (Canada), but I use the seeds all the time in my cooking. Yummmmm. I’m looking for a vegetarian samosa recipe. Can you or any commenters help out? I’m only looking for the filling, as I know how to make the pockets. Thanks. Hi Valerie, you can get methi leaves in Canada. I lived in Winnipeg for somtime and I used to get it in the Indian grocery store and Superstore. You can also look for frozen methi leaves in Indian grocery stores. Check my friends blog for perfect samosas. I love your methi dishes! They look so good. I too sprinkle salt and leave it aside to get rid of the bitterness. Aamchoor added also helps. I make aloo methi very often – almost once in two weeks! The pictures never come out well enough to blog. Wow wat a healthy side dishes..am drooling over methi chhole..looks delicious..
Would love to eat them with roties. Sorry for troubling again,Saw the biscotti comment now only.I will send it across today itself,thanks for including.They were mostly dry I felt because,they were twice baked and were like toasted,but I must say they were moist especially the part around cherries,as the cherries i used were sugared.So I would say 90% dry -10 % moist. Atleast mine were 🙂 Hope I satisfied the question. Lovely..I’m a methi lover. Never seen methi with channa, would love to try it out. Thanks again for informing me about the jello and marshmallow 🙂 I took the easy way out by using these.